University of Michigan researchers have developed a powerful microscope that can map how light energy migrates in photosynthetic bacteria on timescales of one-quadrillionth of a second. The microscope could help researchers develop more efficient organic photovoltaic materials, a type of solar cell that could provide cheaper energy than silicon-based solar cells. In photosynthetic plants and bacteria, light hits the leaf or bacteria and a system of tiny light-harvesting antennae shuttle it along through proteins to what's called a reaction center. Here, light is "trapped" and turned into metabolic energy for the organisms. Jennifer Ogilvie, U-M professor of physics and biophysics, and her team want to capture the movement of this light energy through proteins in a cell, and the team has taken one step toward that goal in developing this microscope. Their study has been published in Nature Communications. Ogilvie, graduate student Yassel Acosta and postdoctoral fellow Vivek Tiwari worked together to develop the microscope, which uses a method called two-dimensional electronic spectroscopy to generate images of energy migration within proteins during photosynthesis. The microscope images an area the size of one-fifth of a human blood cell and can capture events that take a period of one-quadrillionth of a second. Two-dimensional spectroscopy works by reading the energy levels within a system in two ways. First, it reads the wavelength of light that's absorbed in a photosynthetic system. Then, it reads the wavelength of light detected within the system, allowing energy to be tracked as it flows through the organism. The instrument combines this method with a microscope to measure a signal from nearly a million times smaller volumes than before. Previous measurements imaged samples averaged over sections that were a million times larger. Averaging over large sections obscures the different ways energy might be moving within the same system. "We've now combined both of those techniques so we can get at really fast processes as well as really detailed information about how these molecules are interacting," Ogilvie said. "If I look at one nanoscopic region of my sample versus another, the spectroscopy can look very different. Previously, I didn't know that, because I only got the average measurement. I couldn't learn about the differences, which can be important for understanding how the system works." In developing the microscope, Ogilvie and her team studied colonies of photosynthetic purple bacterial cells. Previously, scientists have mainly looked at purified parts of these types of cells. By looking at an intact cell system, Ogilvie and her team were able to observe how a complete system's different components interacted. The team also studied bacteria that had been grown in high light conditions, low light conditions and a mixture of both. By tracking light emitted from the bacteria, the microscope enabled them to view how the energy level structure and flow of energy through the system changed depending on the bacteria's light conditions. Similarly, this microscope can help scientists understand how organic photovoltaic materials work, Ogilvie says. Instead of the light-harvesting antennae complexes found in plants and bacteria, organic photovoltaic materials have what are called "donor" molecules and "acceptor" molecules. 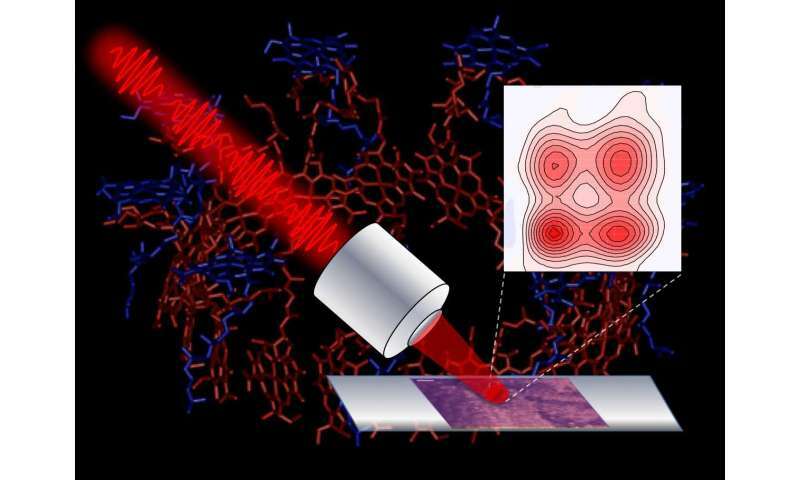 When light travels through these materials, the donor molecule sends electrons to acceptor molecules, generating electricity. "We might find there are regions where the excitation doesn't produce a charge that can be harvested, and then we might find regions where it works really well," Ogilvie said. "If we look at the interactions between these components, we might be able to correlate the material's morphology with what's working well and what isn't." In organisms, these zones occur because one area of the organism might not be receiving as much light as another area, and therefore is packed with light-harvesting antennae and few reaction centers. Other areas might be flooded with light, and bacteria may have fewer antennae—but more reaction centers. In photovoltaic material, the distribution of donor and receptor molecules may change depending on the material's morphology. This could affect the material's efficiency in converting light into electricity. "All of these materials have to have different components that do different things—components that will absorb the light, components that will take that the energy from the light and convert it to something that can be used, like electricity," Ogilvie said. "It's a holy grail to be able to map in space and time the exact flow of energy through these systems." Help searching for SAMs for project!